This article is about the lining of blood and lymphatic vessels. For the endothelium of the cornea, see corneal endothelium. Transmission electron micrograph of a microvessel showing endothelial cells, which encircle an erythrocyte (E), forming the innermost layer of the vessel, the tunica intima. 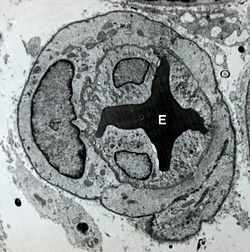 Endothelium lines the inner wall of vessels, shown here. Barrier function - the endothelium acts as a semi-selective barrier between the vessel lumen and surrounding tissue, controlling the passage of materials and the transit of white blood cells into and out of the bloodstream. Excessive or prolonged increases in permeability of the endothelial monolayer, as in cases of chronic inflammation, may lead to tissue edema/swelling. ^ Eskin, S.G.; Ives, C.L. ; McIntire, L.V. ; Navarro, L.T. (1984). "Response of cultured endothelial cells to steady flow". Microvascular Research. 28 (1): 87–94. doi:10.1016/0026-2862(84)90031-1. PMID 6748961. ^ Langille, B L; Adamson, S L (1981). "Relationship between blood flow direction and endothelial cell orientation at arterial branch sites in rabbits and mice". Circulation Research. 48 (4): 481–488. doi:10.1161/01.RES.48.4.481. ^ "FMA". Archived from the original on 2013-10-02. Retrieved 2013-09-28. ^ Kovacic, Jason; Mercader, Nadia; Torres, Miguel; Boehm, Manfred; Fuster, Valentin (2012). "Cardiovascular Development to Disease Epithelial-to-Mesenchymal and Endothelial-to-Mesenchymal Transition: From Cardiovascular Development to Disease". Circulation. 125 (14): 1795–1808. doi:10.1161/circulationaha.111.040352. PMC 3333843. PMID 22492947. Retrieved 8 November 2014. ^ Li X, Fang P, et al. (April 2016). "Mitochondrial Reactive Oxygen Species Mediate Lysophosphatidylcholine-Induced Endothelial Cell Activation". Arteriosclerosis, Thrombosis, and Vascular Biology. 36 (6): 1090–100. doi:10.1161/ATVBAHA.115.306964. PMC 4882253. PMID 27127201. ^ "Blood vessel cells can repair, regenerate organs, scientists say". Retrieved 2018-11-13. ^ Deanfield J, Donald A, Ferri C, Giannattasio C, Halcox J, Halligan S, Lerman A, Mancia G, Oliver JJ, Pessina AC, Rizzoni D, Rossi GP, Salvetti A, Schiffrin EL, Taddei S, Webb DJ (January 2005). "Endothelial function and dysfunction. Part I: Methodological issues for assessment in the different vascular beds: a statement by the Working Group on Endothelin and Endothelial Factors of the European Society of Hypertension". J Hypertens. 23 (1): 7–17. doi:10.1097/00004872-200501000-00004. PMID 15643116. ^ Roberts OL, Holmes K, Müller J, Cross DA, Cross MJ (Dec 2009). "ERK5 and the regulation of endothelial cell function". Biochem Soc Trans. 37 (6): 1254–9. doi:10.1042/BST0371254. PMID 19909257. Anatomy photo: Circulatory/vessels/capillaries1/capillaries3 - Comparative Organology at University of California, Davis, "Capillaries, non-fenestrated (EM, Low)"